In the search for a platform to carry the 105mm leFH18M L/28 howitzer, the chassis of the Panzer II was preferred over those of the Panzer III and IV. The first Wespes proved a great success, and so all Panzer II chassis production was ordered to be used for their manufacture. 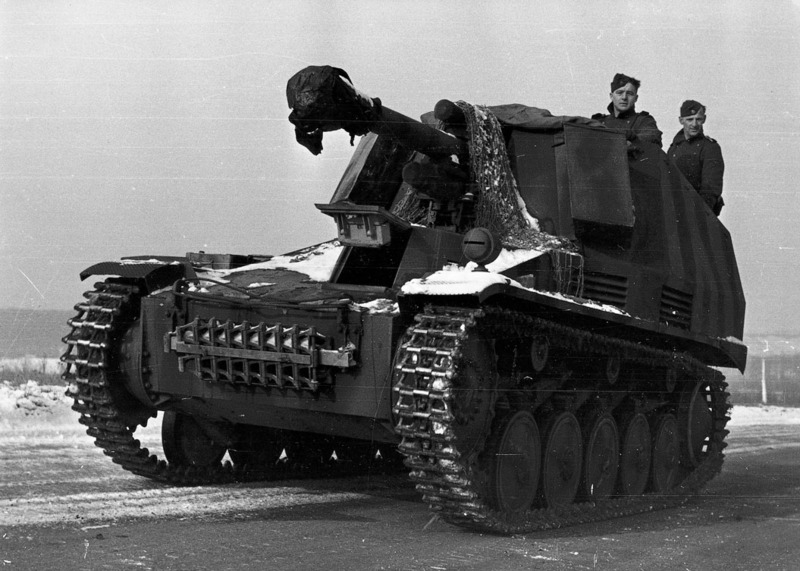 The Wespe was built on a modified Panzer II chassis with the hull lengthened, the engine moved forward, the cooling system louvres redesigned, and the glacis extended. The number of return rollers on the suspension was reduced from four to three, while spring bumper stops were added for the road wheels to absorb recoil. The driver was separated from the rest of the crew, sitting in a small compartment in the front next to the transmission. A total of 32 rounds of ammunition were carried for the main gun. Between February 1943 and July 1943, 676 Wespes were produced, with a further 159 munitions vehicles manufactured during the same period (these vehicles were also designed to mount the field howitzer when other Wespes became unserviceable or were disabled). The Wespe was issued to panzer and panzergrenadier divisions, its first major action being at the disastrous Battle of Kursk in mid-1943. Thereafter, it served on all fronts up to the end of the war.